Yes, Valentine’s Day is a meaningless capitalist holiday invented to sell cards and chocolate, but you’re totally in goth-love, so what to do? You can make out behind a mausoleum or leave roses on graves that bear one another’s first names, preferably at the witching hour. 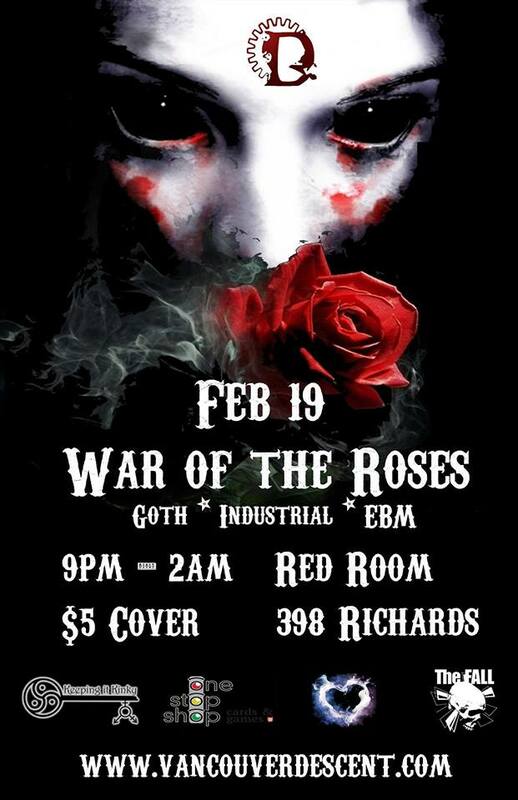 But the best goth date ever is at Descent Sunday’s War of the Roses. If you prefer a Valentine’s Day that’s a little less pretty and a little more “Poe”, let the Descent crew add some raven-colored romance to your February. Join us February 19th for the best new and classic goth, EBM, industrial and 80’s music to warm your dark heart. Descent Sundays boasts an exclusively nonexistent dress code. “Why?” you ask. Well, it’s simple: We want everyone who comes to our events to be comfortable. New people entering the scene, or just checking it out, may not have figured out their style. So you may be wondering what is acceptable. Jeans and a t-shirt? No problem. Full out Goth? Totally AWESOME. Punk kid? Rock god? Sk8tr girl? Great! Sweet! Wicked! Feel like going all out in some jaw dropping ensemble? You’re totally welcome to. Come how you want to but we are strongly encouraging everyone to dress up in their favourite Gothic style. War of the Roses really celebrates the idea of the different sides of love. No matter where you fall down on romance you can express your real thoughts on it here. Vancouver Descent is a friendly place to enjoy some dark culture. Join us February 19th. Don’t stay home, don’t make excuses, Make the Descent!